A union that did not prioritise these would not be the UNISON I know. We want this to be a time for action and not just reflection. Not just a time to learn from the past, but time to shape a new future. We cannot let the fight against racism slide off our agenda. 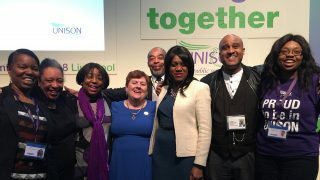 It was a great pleasure to address UNISON Black Members Conference in Liverpool this afternoon. 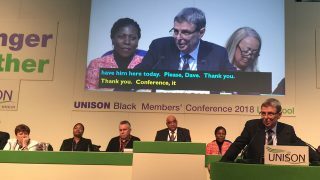 This is a year of historic milestones, so it was great to address the biggest conference of Black Trade Unionists in Europe in this important year – 25 years of UNISON, 150 years of the TUC and 30 years of celebrating Black History in the UK. I’m proud that children today don’t just learn about Florence Nightingale, they also learn about Mary Seacole. And when they learn about Nelson, it’s more likely they’re talking about Mandela – the UNISON member – than the Admiral with the column. But this weekend’s conference isn’t about history, it’s about the present and future of our movement. 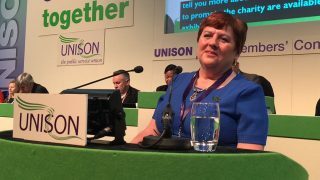 That’s why I’m delighted that UNISON’s own Eleanor Smith MP – the first Black member of Parliament in the West Midlands – will be here tomorrow. 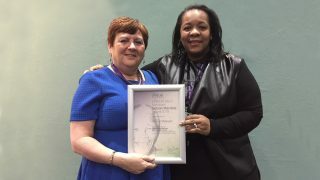 Eleanor was elected as the MP for Enoch Powell’s old seat, a fitting rebuke to the attacks Black people faced from that vile racist, and she’s already making a name for herself in Parliament for her passionate defence of public services, including the NHS – where she still works shifts as a nurse. Eleanor’s election represents a huge personal victory, but is also representative of a real shift in our country, one which our union has played an important role – and will continue to play an important role. I am so proud of UNISON’s history tackling inequality and racism. A union that did not prioritise these would not be the UNISON I know. We want this to be a time for action and not just reflection. Not just a time to learn from the past, but time to shape a new future. We cannot let the fight against racism slide off our agenda. And you have a clear commitment from me – wherever there is racism in our communities or workplaces we will drive it out and we won’t stop until it is defeated once and for all.